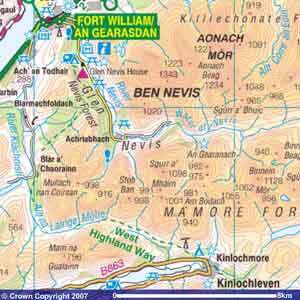 My last day on the West Highland Way, but not my last day of walking, Ben Nevis is next, a have to, since I don’t know when I will be back in this area; and really it has to be done. Leaving Kinlochleven the military road climbs steeply out of Loch Leven valley to about 250m and continues to rise though not as steeply to the summit of the Lairigmor, just over 300m. Often I think before starting any long walk that I will have time to “think about things.” I forget that it does not happen like that for me, what normally happens is that during the first day or so I notice how fast my head is moving. Walking slowly along all this thinking slows down and nearly stops – it is quite a relief and a holiday from normal daily living. However sometimes my mind wanders to how small I am. This is the type of place that it often happens. After Lairigmor the mountains close in, and the valley is all that I see stretching out before me. I feel my smallness in the whole scheme of things. As a human I have a life, I know lots of people, I love, laugh, and cry – but out here… Out here I connect with something else that put a perspective on my life that does not happen as I sit each day in front of a computer thinking how important what I am doing is, and how quickly it has to be finished. Out here there is a freedom, one that I find difficult to put into words; I matter and I don’t, in equal measure, that’s as good as it gets.